Surround Sound connections are either an optical cable (Toslink) or HDMI cable. Connect satellite receiver to audio/video receiver (with loudspeakers) using the optical audio cable or HDMI. Also on the satellite receiver, go into menu, settings, audio, dolby digital and set dolby digital to ON. o Up to date home theater receiver with at least two HDMI input ports and one HDMI out port. 1) OFF-AIR IN – Connect an ATSC VHF/UHF antenna to the DIRECTV Plus HD DVR using this jack. You will be able to watch off-air digital TV broadcasts (ATSC programming) on your DIRECTV HD DVR, and these ATSC channels will appear in the Guide. 2) SATELLITE IN 2 – Use to connect the DIRECTV Plus HD DVR to the satellite dish antenna. 3) SATELLITE IN 1 (FTM) – Use to connect the DIRECTV Plus HD DVR to a second LNB on the satellite dish antenna, giving you the ability to watch and record up to two programs at once. If your installation includes an FTM (Frequency Translator Module), connect the FTM output to this input. FTM is a technology that allows multiple tuners to work with a single satellite input. 4) PHONE – Connects the DIRECTV Plus HD DVR to a telephone wall jack. A land-based telephone connection is needed to communicate periodically with the DIRECTV Plus HD DVR. 5) COMPONENT OUT/ YPbPr – Provides good HD picture quality, but not as good as HDMI. YPbPr carries only picture information, not sound; use it along with a digital audio connection or AUDIO (L/R red/white) jacks. 6) AUDIO (R-Red and L-White) – Audio cables offer better sound quality than RF coaxial cables. You can connect a second set of audio cables to another component, such as a VCR or stereo. 7) VIDEO (Yellow) – Provides good picture quality for standard-definition TV. Connect the second RCA-type composite VIDEO jack to another device, such as a VCR. You must also connect the AUDIO cables when using the VIDEO connection. 8) S-VIDEO OUT – Provides the best picture quality for standard-definition TV, better than VIDEO RCA-type jacks. If your TV has an S-Video jack, use it along with the AUDIO jacks (S-Video only carries picture information, not sound) to connect to your TV. 9) DIGITAL AUDIO OUT (OPTICAL) – Provides digital-quality audio signal. 10) HDMI – Provides the best quality HD picture. The HDMI also provides audio, for a high-quality, “one-cable” solution. 14) AC POWER INLET – Connects to an electrical outlet. DIRECTV high-definition and standard-definition digital programming via satellite, including local channels if offered in your area (DIRECTV service subscription required). Local digital broadcast TV channels, including any local HD broadcasts shown in your area, available via the DIRECTV Satellite or an off-air VHF/UHF antenna. To enjoy select HD programming available on off-air local channels, you will also need an off-air antenna connected to your DIRECTV Plus HD DVR. This is possible only in cities where local broadcast stations make digital TV programs, including high-definition, available. Major metro areas can get local TV channels from DirecTV without using an over-the-air antenna. The recommended audio format for HDTV is Dolby Digital. The DIRECTV Plus HD DVR is capable of reproducing 5.1-encoded audio: five discrete channels of full-range digital audio, plus one channel of low-frequency (subwoofer) audio, for use by A/V receivers capable of decoding the 5.1-channel signal. The audio signals are broken into left-front, center, right-front, left-rear, right-rear and low-frequency channels. The result, when your DIRECTV Plus HD DVR is connected to a compatible Dolby Digital A/V receiver and 5.1 channel speaker setup, is an experience that gives you much of the dynamic range, 360-degree imaging and sonic excitement of a real theater. Not all TV programs deliver 5.1 channel signals, and not all programs are broadcast using Dolby Digital for DIRECTV programming. Programs using this high-quality audio standard are indicated by the words Dolby Digital in the program description in the Channel Banner and Guide. On: Turns on Dolby Digital audio output. Note: True Dolby Digital is only available via HDMI or optical / digital coaxial outputs. Off: Select this option to turn off Dolby Digital Audio output. The DIRECTV HD DVR incorporates HDMI™ [or High-Definition Multimedia Interface] technology. HDMI offers a high-quality connection that combines the video and audio signal into a single cable. The HDMI jack uses HDCP content protection to allow you to view HD programming that has been encoded using the HDCP protection system. For the best access to HD programming at the highest available resolution, connect this to an HDTV that supports HDCP technology. 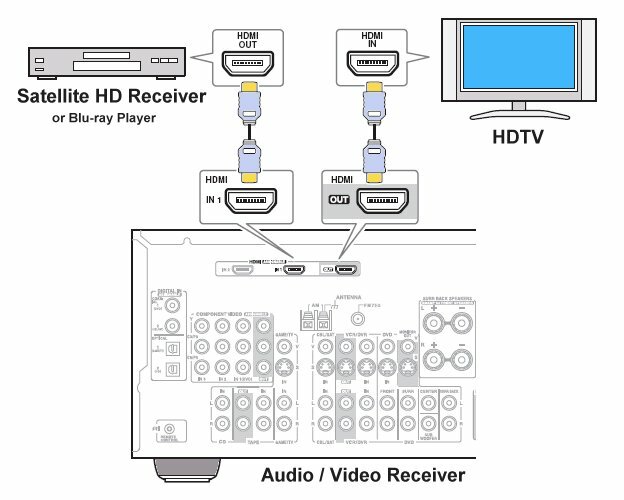 The component connector provides high-quality video for your HDTV system. Component video is also referred to as “YPbPr.” It uses three separate cables—with connectors colored green, red and blue—one for each component of the HD video signal. A separate audio connection is also required, using either Digital Audio Optical cable or the audio portion of an A/V cable. The Digital Audio Optical cable provides the best quality audio. The jack and cable use light to send digital audio data to A/V receivers equipped to receive and interpret it. The jack and cable must be aligned before plugging in, and may be covered by protective caps, which must be removed before making connections. Use caution when handling optical cables. Position the speakers where you want them around the room. For each speaker, take a roll of speaker wire and measure out how much you'll need to get the wire from the speaker to where you've placed your Audio/Video receiver, then add an extra 6 feet or so. Allow for the entire route of wiring including turns, angles, up, down, and around. About 6 inches from the end of each wire that you've placed near the receiver, make a mark that will help you figure out which wire goes to which speaker (left front, right front, center, left rear, right rear and sub). To connect the wire, strip off about 1/2 to 3/4 of an inch off the end, then pull the ends apart, separating a bit of the remaining wire. Twist the threads of each side of the wire together. Connect this side into the red speaker connector. Insert the other side into the black speaker connector. Complete this process for each speaker. At the receiver, complete the stripping process for each of the wires, then insert the ends into the appropriate speaker port--these should be well marked on your receiver. Connect your subwoofer into the back of the receiver using your subwoofer cables. Also, if your receiver has a power port on the back, plug your subwoofer into the receiver. This will allow you to shut off power to your subwoofer by simply shutting off the receiver. Your source component (cable/satellite receiver or DVD player, etc.) must also support HDMI output of the above audio formats. 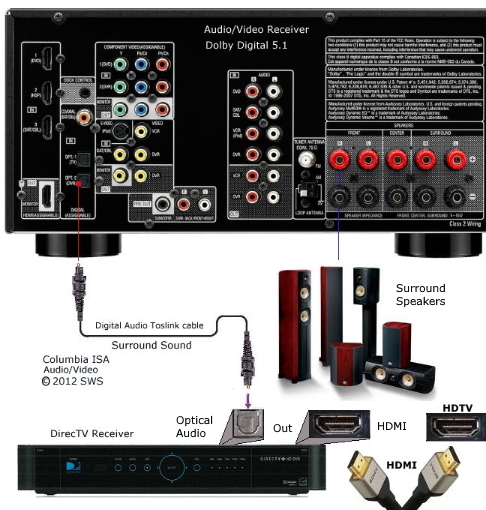 Digital audio signals received by the HDMI IN jacks are output by the loudspeakers connected to the A/V receiver/AV amplifier. Normally, they are not output by the HDMI OUT (To TV), unless the HDMI Audio Out setting is set to ON. Connect one of the HDMI cables to the back of your DirecTV HDMI output port. Then connect it to the back of the appropriate HDMI input port on the A/V receiver. Some receivers will require you to "assign" an HDMI port to a certain setting on the receiver, for instance, assign an HDMI port to the mode that will control your television. Check your A/V receiver's manual for more information on this. Plug in any other devices you might want to use into the back of the receiver such as a DVD player. If your TV has an HDMI port, connect the second HDMI cable to "Monitor Out" or "Out to TV' or the like on the back of your A/V receiver. Then connect the other end to the HDMI input port on the back of the television (HDTV). If you do not have an HDMI port on your television, do the same with your component video cables, connecting them according to color code (your receiver will have a Video Out, or Monitor Out for these as well). Set the television to the appropriate input. Turn the volume on your TV all the way down; if you have sound coming from your TV speakers AND surround sound, it's apt to sound off-balance. You'll just need your home theater surround sound system now. Both the A/V Receiver and the DirecTV receiver have audio settings which may need to be selected for the proper output. Check owner's manuals here.